It requires strategic planning to defeat Blob & Mystique. Firstly, both heroes in this battle are Tacticians while Mystique is an infiltrator. As such, she will always counter non-Psychic attacks. Secondly, she gets a lot of free turns by using Iso-8 Enhancement on her first turn (note: this will remove Mental Anguish without harming her); however, the secret to winning is actually using her many free attacks against her. Blob will protect her with a passive version of Immovable Object. Notice that, due to Mystique's Zeal of the Brotherhood ability, Blob regains all of his Health at every turn and cannot be K.O. 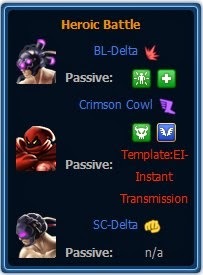 'ed; however, Mystique's own version of the passive means defeating her will also defeat Blob. The first time Magneto attacks Blob, a scene will appear where Magneto politely asks Blob to get out of the way, and Emma says she'll "handle him," after which, Blob will gain a passive that makes him susceptible to Mental Anguish. Hit Blob with Psychic Tap. He will lose Immovable Object and gain the Brainwashed debuff which will force him to attack Mystique whenever she attacks (which is often). From this point, focus your attacks on Mystique. As her attacks cause Weak Point, hit her with Electromagnetic Blast as soon as you can, as Magnetized prevents critical hits. Use Unlock Potential sparingly; as a Quick Action, it will not consume a turn, like Magnetic Field (without the Quick E-ISO). However it may be needed to remove debuffs which are having a negative impact on your ability to dish out damage, or restore Stamina without wasting turns resting. Unless you have the Quick E-ISO equipped on it, Magnetic Field is a low priority and a wasted turn. As Stunned targets cannot counter, your try to stun Mystique with your heroes respective stunning attacks, and gain a free attack with the next character if the turn order allows. 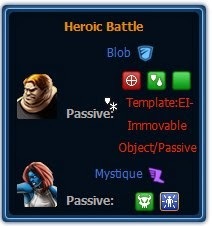 Blob will continue to attack Mystique every time she attacks for several rounds. He will also continue to attack you during his turn as normal. Ignore him; focus on Mystique. Once Mystique is defeated, Blob will be also. Good luck! A few rounds in, Abomination will taunt you and you have the option to respond with "Banner" or "Hulk Smash!" If you choose "Banner", Abomination will go into suspended animation. If you choose "Hulk Smash! ", you will regain the ability to gain Hulk Up and get 5 stacks of it. Abomination will then get damage boosts and free turns. Relentless Empowered Iso-8 is essential for this battle, as Hulk cannot afford to be stunned. With this battle, it's starting to show just how good Sif's Modern Alternate truly is. In order to dispatch the Enchantress quickly, Sif in her Modern outfit will crit every time she attacks. One of the major annoyances with this battle is Enchantress will be immune to bleed, removing Sif's best way to quickly dispatch her. Another annoyance is Enchantress constantly taunting Sif giving her a choice between ignoring her and getting into a rage. Choosing to rage gives Sif the Raging Barbarian debuff(?) which greatly increases her damage at the cost of her accuracy. You cannot afford to miss any attacks, so make sure to keep Raging Barbarian down to one by choosing to Ignore after attacking with Raging Barbarian on the previous turn. Finally, Enchantress will also be casting Magic Missile which is going to have the Chaos Shot effect and cause random DoT debuffs. The quickest way to get rid of her is to use Leaping Slash as it will inflict Tenderized and cause Amora to take more damage from Sif's other attacks. This battle is quite difficult, but if you have access to alternative uniform, it is quite easy to win. 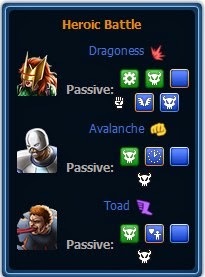 Every enemy has some special Brotherhood passives that can be annoying, mainly Toad's one (protection and counter effect), and Avalanche's one (gives extra turns in the same way Uncanny Cyclops does, but more often). The easiest way to deal with them is by not having the weak classes, so if you have the chance try using Scrapper Colossus and Blaster Cyclops. First of all, Toad should your first target. To avoid his counter attacks, hit him with Cyclops's Exploit Weakness and then don't stop hitting him with the others, while using Storm for defensive duty (which means using Protective Shroud as soon as you can). As soon as you'll defeat him, Avalanche and Dragoness will get a buff, which gives them follow-up attacks pretty like Ares' War Never Changes. Just choose one of them and take him/her out: if you have Bruiser Colossus, Dragoness should be killed first, since she could be a serious trouble for him. Bear in mind that Dragoness's Mechanical Wings can be deactivated with Storm's Level 1 ability. When you defeat one of them, the last one will take 4 actions in a round. Probably this will be Avalanche, so just use Colossus' Steel Curtain to defend the party. This battle is mostly about luck. Captain Britain will face two test subjects (Blaster and Scrapper) and Crimson Cowl (Infiltrator). Strange passives: Captain Britain has the White Knight passive, which gives True Strike to all his attacks when he has Roar of Valor. Also, he has the Gentleman debuff: with this, he loses Roar of Valor whenever he attacks Crimson Cowl. What's worse, the boss has an avoidance effect, and that's why True strike is needed. Having to deal with a Scrapper is awesome: you'll get Enraged and so you'll take less damage from all the attacks, except the Blaster's ones. It means that the Blaster should be your first target. Hit him with L1 abitlity, so that he'll be weakened, but be careful, since with one attack he can drop your health to 30-40% making the battle a lot harder, especially if you're also poisoned (Blaster attack) or bleeding (CC). After defeating the blaster, focus your attacks on CC and for last the scrapper. When you attack an enemy (anyone), hit him with L1 to cause weakened, and then L9 him to death in order to exploit debuffs. First things first, purchase a Cleansing Empowered Iso-8 (20 gold) and equip it to Mockingbird. This battle is virtually impossible to win without it, as Zemo can inflict bleeding with both attacks and counter-attacks. However, with the Cleansing E-Iso, one debuff is removed at the beginning of every turn, and also preventing the damage caused by the stack of bleeding that is removed, drastically improving the chances of success. The battle features Mockingbird in a two-on-one fight with Baron Zemo and one lackey. A strategy to winning is do not KO the lackey until Zemo is KO'ed first. This can prove difficult, seeing as the lackey will protect Zemo for the first three rounds. However, if you are lucky, you may get the first shot in on Zemo. Only do this if you or the Lackey went first: use MB's L6, then use her L2 on the lackey. If you're lucky enough to both stun the lackey and trigger an extra turn for MB, hit Zemo with her L1. He will counter with a bleeding, but that's not unexpected. Keep an eye on the lackey's protect effect. Wait until it's gone, then hit Zemo with MB's L1 and hope for at least three effects from Pressure Points. Next turn, if MB has the Blaster bonus (from having been attacked by the Bruiser lackey), attack with her L9. If she doesn't have the Blaster bonus, use her L6 to apply Weak Point , and then use her L9. Repeat until Zemo is defeated, then turn your attention to the lackey. He shouldn't be any difficulty. Note: if the lackey is defeated before Zemo, two more will take his place; another Bruiser and a Tactician who can both protect Zemo with "Hail Hydra!" for a turn. It's harder to defeat Zemo first since you will be taking counters (and therefore stacking Bleeding a lot) and won't bypass protection, however if you are lucky enough, doing so will avoid facing 2 more goons. Note2: Alternatively, you can kill the first lackey and use the tactician to your advantage, as you will now be able to get Combat Reflexes. 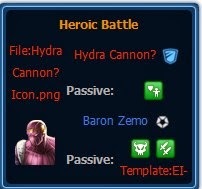 This will allow you to counter attacks (causing damage to all enemies while still allowing you to recharge and heal if you equip the Recovering E-iso), bypass "Hail Hydra" and not be countered with Zemo's bleeding skill. Note3: Regardless of the strategy you choose, you will still need a lot of luck. sif heroic battle is so hard.. even with her modern uniform scrapper.. i have her lvl12 with 12 reactive powerful iso-8.. any tips? You cannot use stun on Mystique, she is immune. Mockingbirds battle, DO NOT KILL THE HENCHMEN!!! He will just call more. Use lvl2 attack to stun his protector and try and slip in an attack on Baron if you get a stun to stick on his protector. Otherwise wait out his protection and lay into Baron. The cleansing ISO for generalist helped a lot to remove the bleeds. I could not beat the Heroic Hulk battle, any hints guys? got th sif HB done, use attack n evasion ISOs, slash enctrss with 2nd move only, pick rage then ignore next. it easier when you got the 1st attack. Currently i still dont know how 2 win Cap Britain HB. i can't beat ANY of the heroic battles. they all seem a little over powered imo. managed the storm cyclops and colossus one.. helped having set summers to his alt (the one granted for doing everything for his extra suits) equipped. also, both he and petr where level 13. storm's only level 11 at the mo. trick was IIRC, to take toad out first. go with their individual buff teams first and that should do the trick. well,....The Luck is the keys of Heroic Battle??!! What the Heroic About it???? Just another PD "try to sell" ALT custom and bunch craps. getting more n more less interested on the game. did as suggest with sif.... she still takes way too much damage. level 12, now got the alt costume (which I was saving cp for more characters). and still have no idea weither to rage or not? For the MB battle the trick is to finish your round with combat reflexes, hitting the tactician, this way you will get several powered free counter attacks every round, damaging them main objective, the baron. Getting e-iso or/and the new one for crit in first MB attack will help you a lot, anyway is just a time business. so need gold buy equip and win the heroic battle?? Heroic Battles are a waste of time and are only won by luck and chance. Heroes abilities are debuffed and it doesn't matter what level you train them to. As someone said previously they won after five fights and didn't even know how they did it. Like everything else in this game they are time released. How is Hulk to beat Abomination or CB to defeat CC if they never gain their special abilities. This fight mode is designed for you to fail and have you spend all your CP before a new uniform or character is released. These Herioic Battles IMHO have been made so difficult in order to get you to spend a small fortune in gold and command points silver and shield points. Most require you to purchase an Alt costume, and an Empowered ISO-8 to even have a chance of actually beating them, plus you need to then get lots of Reactive ISO-8 to have even a slight chance of winning. I use her buff and then just use the Lvl 2 attack over and over. Also, I just ignore her otherwise she effs you up if you choose rage. Also, it helps to go first. I have not lost one time going first, but have a couple losses if she goes first. As long as abomination has gamma aura your chances of winning the battle are very very slim. While you continue to simply take damage who can beat an enemy who is almost as strong as you and just regains hp every few rounds? First of all I've equipped Hulk with Relentless Empowerd Iso-8 and Charged Blackbelt A-Iso on L1 ability (Rage Punch) won during Season 2 Chapter 5, then you can start your battle. When you have to choose with “Banner” or “Hulk Smash” stay calm and select Banner. Does anyone know what "True Strike" is for Captain Britain's battle??? Does anyone know where I can get it? I can't find it in the store.